Hey, so I'm writing this story, which will be sort of longish, and even though I know my writing can't ever compare with, say, Starseeker's or Rogue Wildling's, I still want to post what I have so far here to get some feedback from you guys. Criticism is awesome, I know I need it, and encouragement is good, because as you can see I don't have much self-esteem when it comes to writing, so I'm just putting this out there for y'all. 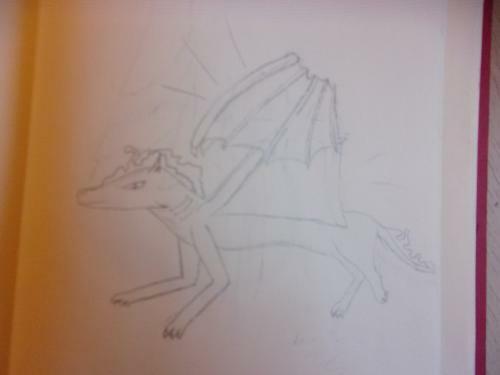 If it seems like I'm copying Wings of Fire, the main character is actually based off Clay, but any other similarities are unintentional.Thanks for reading! The green dragon, her necklace swinging, swam in a lazy circle before the gate of the huge bluestone building. She narrowed her eyes, blue as the ocean's surface, when Ronilian came up to her, waterproof scrolls and clay tablets clutched close. "New student?" she asked, swooping towards him. Silver scales dotting her graceful wings shone dazzlingly bright in the ever-shifting light of the sea, making Ronilian blink his yellow eyes. "Yes," he replied, handing the guard a clay tablet confirming this. "I'm Ronilian." The guard gave him a curious glance. "I can tell," she said, nodding to the document. "OK, here you go," said the green dragon, handing the tablet back to Ronilian. She opened the gate. "I'm Kelaziah. See you next period." She nudged the larger dark gray dragon in with her wing and shut the gate behind him. Ronilian went through the small coral garden up to the door, slightly confused. Why had Kelaziah said "see you next period?" She was the guard, wasn't she? Though it was clear by just looking at her and hearing her voice that she was not full grown. Ronilian opened the graystone door, which moved lightly on its well-fashioned granite hinges, and entered a long, blue-carpeted hallway with a flight of upward-leading stairs at the end. Along the walls were 24 doors, 12 on the right and 12 on the left, each with a different picture carved on it. Instructions: Show this to guard. Upon entering biulding, go to Angelfish Door. Give this to Draykalia. Ronilian spotted the Angelfish Door, the second door on the left side. The carving on it reminded him of the fish he had seen outside, the one with creepy eyes. Perhaps the Fish with Creepy Eyes was a stalker and would start showing up everywhere, even his dreams. But there was no time for thoughts of that sort now. Cautiously, though he was excited, Ronilian pushed the door open with his yellow-white claws. It swung open, bubbles trailing from the hinges. 16 multicolored heads turned towards him, including the teacher's. Draykalia was an unusual sea dragon; she was blue-white with black stripes, and had a strange tilt in her movement as she swam up to Ronilian. She was quite small compared to him; Ronilian felt awkward at the thought that he was a bigger dragon than his teacher. There's a lot more to Chapter 1, but I don't have the time. So, guys, break this thing down, point out every erroneous detail, every flaw; I'll appreciate it! And check up on this thread often please; I know this isn't very suspenseful, but it will be, I promise! "Welcome, Ronilian, to the School of the Sapphire. You are from New Riven, correct?" "I'd rather live and work in a free place, an ancient and longstanding place that uphold the sacredness and independence of dragonhood. New Riven is taking too much after the human; all organized and cynical and 'no teaching the draglets how to fight in battle, it's not healthy' and 'let's not teach the old myths and history, it'll give the draglets ideas.' No, Trekal, city of the Blue=Tide, is the place for us, Ronilian, us and your sweet mother!" Ronilian hadn't liked New Riven for thw same reasons as his dad, and, also like his dad, he hoped Trekal and the School of the Sapphire would be better. "Why don't you start, Silversheath? And in case it wasn't clear, this is Ronilian, Ronilian Roamson." OK, could you please top this post!? HaAnG oN a SeCoNd HeRe. You think my writing is as good as Starseeker's?? *Silently has a self-confidence boost* Thank you so much! I don't understand why you're comparing your writing to mine. Mine... Isn't great, in my eyes. You're writing is really good, and I enjoy reading it! Ooh a dragon school. I like this. Also, Rogue, I think people generally hate their own writing but like others’. I definitely see a lot of “mine’s terrible, but yours is great” comments. It’s like when you cringe at the sound of your own voice recorded and played back to you. That’s just my theory though. Touché. However, I also can recognize when I've done a particularly good job, and I'm proud of those instances. Ronilian stood awkwardly in front of the class as a silvery-blue dragon with unusually long and pointed scales rose from her lounging position on her sitting-stone. "I'm Silversheath Darkdrop," said the dragon in a slow, heavy voice. "This is the reason for my name." Suddenly all her scales, and a sort of outer layer on her claws, flipped up or out, revealing her bright diamond hide underneath. The light that came from it dimmed and grew brighter with the beat of her heart, and her upturned scales (or spikes!) looked lethally sharp. Ronilian blinked as the light hit his eyes. "Very impressive," he said. "Thanks," replied Silversheath in an "I'm used to that comment" attitude as she flipped the sheaths back fully on her slim, though strong, body again. 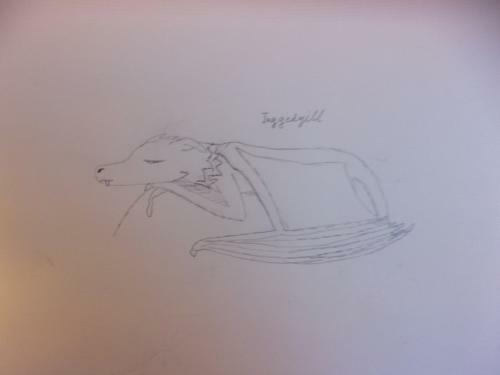 The next to stand up was Jaggedgill a sleepy-looking magenta dragon with uneven, sharp scales. He said something which Ronilian could not quite make out (it was mostly mumbles and yawns) and sat down again, propping his head thankfully on his arm and staring at Ronilian through half-closed azure eyes. His colorings aure are different from his personality, thought Roniilan as a pink-and-silver draglet named Salmon introduced herself with a flirty smirk. The other new classmates of Ronilian's were Berayn, Tejayl, Crystal, Diamondweed, Drift, Shumi, Craiz, Steamfall, Polypsa, Ruffleneck, Mooneye, and Redstone, next to which Ronilian's sitting-stone was. As he lumbered over to her, the bright yellow dragon with a ruby on her forehead beamed, claws clasped under her nose and the thin gold chains around her neck swiging over her femininely muscular chest.A shy yet mischievous smile, rather like Salmon's, was on her lips, and she turned her head to look at Ronilian as he sat down. "Hello, Ronilian," she said quietly, lime green eyes flashing as she turned, hindquarters twitching, back to the front. "Well, Ronilian, we'll have to get acquainted later, because you have music class now!" OK, that's at least a little bit more. Chapter 1 has a long way to go still, though! Also, guys, I need your opinion: should there be a ship with Ronilian and Redstone??? What where did it go????? ?